Mount Kailash, depicting the holy family: of Shiva and Parvati cradling Ganesha. The axis mundi (also cosmic axis, world axis, world pillar and center of the world) is a symbol representing the center of the world where the heaven (sky) connects with the earth. Different cultures represent the axis mundi by varied symbols such as a natural object (a mountain, a tree, a vine, a stalk, a column of smoke or fire) or of a product of human manufacture (a staff, a tower, a ladder, a staircase, a maypole, a cross, a steeple, a rope, a totem pole, a pillar, a spire). Its proximity to heaven may carry implications that are chiefly religious (pagoda, temple mount, church) or secular (obelisk, minaret, lighthouse, rocket, skyscraper). Additionally, the axis mundi may be feminine (an umbilical providing nourishment), masculine (a phallus providing insemination into a uterus), or neither (e.g the omphalos (navel). The axis mundi features prominently in cultures utilizing shamanic practices or those with animist belief systems. Yet it also appears in the most technologically advanced cultures—wherever the impulse persists to link a tower with the idea of a "world center." The term axis mundi derives from the Latin words "axis" and "mundi" or world, together meaning "pivot point, or line, connecting the earth and the sky/heavens." Throughout history, most cultures have described their own homeland as "the center of the world" because it was the center of their known universe. For example, the name of China—"Middle Kingdom"—expresses an ancient belief that the country stood at the center of the world. Within this central known universe a specific spot—often a mountain or other elevated place, where earth and sky come closest—gains status as center of the center, the axis mundi. High mountains are typically regarded as sacred by peoples living near them. Shrines are often erected at the summit or base. 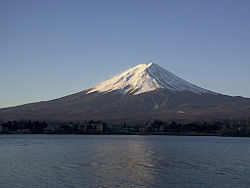 Japan's highest mountain, Mount Fuji, has long symbolized the world axis in Japanese culture. Mount Kun-Lun fills a similar role in China. Sioux beliefs take the Black Hills as the axis mundi. Mount Kailash is holy to several religions in Tibet. In ancient Mesopotamia, the cultures of ancient Sumer and Babylon erected artificial mountains, or ziggurats, on the flat river plain. These supported staircases leading to temples at the top. The pre-Columbian residents of Teotihuacán in Mexico erected huge pyramids featuring staircases leading to heaven. The Middle Kingdom, China, had a central mountain, Kun-Lun, known in Taoist literature as "the mountain at the middle of the world." To "go into the mountains," meant to dedicate oneself to a spiritual life. Reconstruction of Etemenanki, an ancient Mesopotamian ziggurat (based on Schmid). Because the axis mundi is an idea that unites a number of concrete images, no contradiction exists in regarding multiple spots as "the center of the world." The symbol can operate in a number of locales at once. The ancient Greeks regarded several sites as places of earth's omphalos (navel) stone, notably the oracle at Delphi, while still maintaining a belief in a cosmic world tree and in Mount Olympus as the abode of the gods. Judaism has Mount Sinai and Mount Zion, Christianity has the Mount of Olives and Calvary, Islam has the Temple Mount (Dome of the Rock) and Mecca. In addition to Kun-Lun, the ancient Chinese recognized four mountains as pillars of the world. All sacred places constitute world centers (omphalos) with the altar or place of prayer as the axis. Altars, incense sticks, candles and torches form the axis by sending a column of smoke, and prayer, toward heaven. The architecture of sacred places often reflects this role. The stupa of Hinduism, and later Buddhism, reflects Mount Meru. Cathedrals are laid out in the form of a cross, with the vertical bar representing the union of earth and heaven as the horizontal bars represent union of people to one another, with the altar at the intersection. Pagoda structures in Asian temples take the form of a stairway linking earth and heaven. A steeple in a church or a minaret in a mosque also serve as connections of earth and heaven. Structures such as the maypole, derived from the Saxons' Irminsul, and the totem pole among indigenous peoples of the Americas also represent world axes. The calumet, or sacred pipe, represents a column of smoke (the soul) rising form a world center. A plant can serve as the axis mundi. The tree provides an axis that unites three planes: Its branches reach for the sky, its trunk meets the earth, and it roots reach down into the underworld. In some Pacific island cultures, the banyan tree, of which the Bodhi tree is of the Sacred Fig variety, is the abode of ancestor spirits. The Bodhi Tree is also the name given to the tree under which Gautama Siddhartha, the historical Buddha, sat on the night he attained enlightenment. 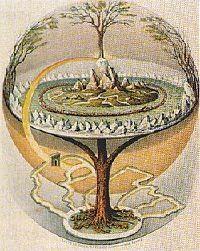 The Yggdrasil, or World Ash, functions in much the same way in Norse mythology; it is the site where Odin found enlightenment. Other examples include Jievaras in Lithuanian mythology and Thor's Oak in the myths of the pre-Christian Germanic peoples. The Tree of Life and the Tree of Knowledge of Good and Evil in Genesis present two aspects of the same image. Each is said to stand at the center of the Paradise garden from which four rivers flow to nourish the whole world. Each tree confers a boon. Bamboo, the plant from which Asian calligraphy pens are made, represents knowledge and is regularly found on Asian college campuses. The Christmas tree, which can be traced in its origins back to pre-Christian European beliefs, represents an axis mundi. Entheogens (psychoactive substances) are often regarded as world axes, such as the Fly Agaric mushroom among the Evenks of Russia. The human form can function as a world axis. Some of the more abstract Tree of Life representations, such as the Sefirot in Kabbalism and in the Chakra system recognized by Hinduism and Buddhism, merge with the concept of the human body as a pillar between heaven and earth. Disciplines such as Yoga and Tai Chi begin from the premise of the human body as axis mundi. Astrology in all its forms assumes a connection between human health and affairs and the orientation of these with celestial bodies. World religions regard the body itself as a temple and prayer as a column uniting earth to heaven. The Renaissance image known as the Vitruvian Man represented a symbolic and mathematical exploration of the human form as world axis. Houses also serve as world centers. The hearth participates in the symbolism of the altar and a central garden participates in the symbolism of primordial paradise. In Asian cultures, houses were traditionally laid out in the form of a square oriented toward the four compass directions. A traditional Asian home was oriented toward the sky through Feng shui, a system of geomancy, just as a palace would be. Traditional Arab houses are also laid out as a square surrounding a central fountain that evokes a primordial garden paradise. The nomadic peoples of Mongolia and the Americas more often lived in circular structures. The central pole of the tent still operated as an axis but a fixed reference to the four compass points was avoided. A common shamanic concept, and a universally told story, is that of the healer traversing the axis mundi to bring back knowledge from the other world. It may be seen in the stories from Odin and the World Ash Tree to the Garden of Eden and Jacob's Ladder to Jack and the Beanstalk and Rapunzel. It is the essence of the journey described in The Divine Comedy by Dante Alighieri. The epic poem relates its hero's descent and ascent through a series of spiral structures that take him from through the core of the earth, from the depths of Hell to celestial Paradise. Anyone or anything suspended on the axis between heaven and earth becomes a repository of potential knowledge. A special status accrues to the thing suspended: A serpent, a victim of crucifixion or hanging, a rod, a fruit, mistletoe. 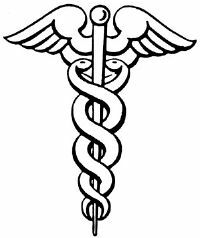 Derivations of this idea find form in the Rod of Asclepius, an emblem of the medical profession, and in the caduceus, an emblem of correspondence and commercial professions. The staff in these emblems represents the axis mundi while the serpents act as guardians of, or guides to, knowledge. Axis mundi symbolism abounds in the modern world. A symbolic connection between earth and sky is present in all skyscrapers, as the term suggests, and in other spires. Such buildings come to be regarded as "centers" of a civilization and icons of its ideals. The first skyscraper of modern times, the Eiffel Tower in Paris, France, exemplifies this role. Taipei 101 in Taiwan, a twenty-first century descendant, unites the images of staircase, bamboo, pagoda, and pillar; at night, it also evokes a candle or torch. The Washington Monument in the United States and capital buildings of all sorts fill this role. The Burj Dubai (United Arab Emirates) will fill the role as it adopts characteristically Arab axis mundi symbols. The design of a tower emphasizes different elements of the symbol. Twin towers, such as the Petronas Towers (Kuala Lumpur, Malaysia) and World Trade Center (Manhattan), maintain the axis symbolism even as they more obviously assume the role of pillars. Some structures pierce the sky, implying movement or flight (Chicago Spire, CN Tower in Toronto, the Space Needle in Seattle). Some structures highlight the more lateral elements of the symbol in implying portals (Tuntex Sky Tower in Kaohsiung, Taiwan, The Gateway Arch in Saint Louis). Ancient traditions continue in modern structures. The Peace Pagodas built since the 1947, unite religious and secular purposes in one symbol drawn from Buddhism. 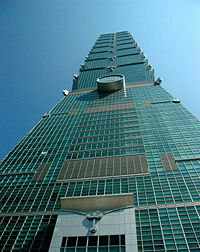 The influence of the pagoda tradition may be seen in modern Asian skyscrapers (Taipei 101, Petronas Towers). The ancient ziggurat has likewise reappeared in modern form, including the headquarters of the National Geographic Society in Washington, DC and The Ziggurat housing the California Department of General Services. Architect Frank Lloyd Wright conceived the Guggenheim Museum in New York as an inverted ziggurat. Modern artistic representations of the world axis abound. Prominent among these is The Endless Column (1938), an abstract sculpture by Romanian Constantin Brâncuşi. The column takes the form of an umbilical or pillar linking earth to sky even as its rhythmically repeating segments suggest infinity. The association of the cosmic pillar with knowledge gives it a prominent role in the world of scholarship. University campuses typically assign a prominent axis role to some campus structure, such as a clock tower, library tower or bell tower. The building serves as the symbolic center of the scholastic "world" and as an emblem of its ideals. The symbolism also appears in the image of the "ivory tower," a colloquial metaphor for academia. The image may still take natural forms, as in the American tradition of the Liberty Tree located at town centers. Individual homes continue to act as world axes, especially where Feng shui and other geomantic practices continue to be observed. Axis mundi symbolism may be seen in much of the romance surrounding space travel. A rocket enables travel from earth to the heavens. On the launch pad, it shares the symbolism of a tower, and at lift-off, it creates a column of smoke from earth and sky. Astronauts embody the mythic story. Each embarks on a perilous journey into the heavens in the quest for knowledge; if successful the adventurer returns with a boon that benefits all the world. The motto on Apollo 13 insignia in 1970, stated the story succinctly: Ex luna scientia ("From the Moon, knowledge"). The ash tree growing in Hunding's living room, in Act 1 of Die Walküre (The Valkyrie), is one of many appearances of the image in the operas of Richard Wagner. Hunding's tree recalls the World Ash visited by Wotan, a central character in the Ring cycle of which this opera forms a part (1848-1874). The Emerald City in the land of Oz, depicted in the popular book by L. Frank Baum (1900) and the subsequent MGM film (1939), stands at the center of the four compass directions. It resembles a stand of trees and is a destination for those seeking wisdom. Orodruin, location of the creation and destruction of the One Ring, is one of many representations of the symbol in The Lord of the Rings, by J.R.R Tolkien (1937-1949). Two Trees of Valinor in Tolkien's tellingly named Middle-earth produce the light of the Supreme God (1937-1949). The wardrobe and lamppost in The Chronicles of Narnia by C. S. Lewis (1949-1954) mark the spots where children travel between this world and the next and the place where the world ends. In an episode of Seinfeld titled "The Maid," Kramer finds himself at the corner of "1st and 1st…the Nexus of the Universe." The wooded hilltop and ascending and descending staircases in The Midsummer Marriage, an opera by English composer Michael Tippett (1955), explore Jungian aspects of the symbol. The pillar of fire rising to heaven from the ark of the covenant is recalled in the climax of Steven Spielberg's 1981 film, Raiders of the Lost Ark. A huge sheltering tree on a hilltop appears near the end of Stealing Beauty, a 1996 film by Bernardo Bertolucci, to crown a series of images evoking the primordial Paradise garden. In the surreal urban world of Gotham City, the Wayne Building acts as the symbolic center in Christopher Nolan's Batman Begins (2005), as does a fantastic cathedral-skyscraper-staircase-ladder combination in an earlier film by Tim Burton (1989). ↑ Jean Chevalier and Alain Gheerbrandt, The Penguin Dictionary of Symbols (London: Penguin Books, 1996, ISBN 0140512543). ↑ J. C. Cooper, An Illustrated Encyclopedia of Traditional Symbols (New York: Thames and Hudson, 1978, ISBN 0500271259). ↑ Online Etymology Dictionary, Axis Mundi. Retrieved February 18, 2008. ↑ Chevalier and Gheerbrandt, 680-685. ↑ Chevalier and Gheerbrandt, 681. ↑ Chevalier and Gheerbrandt, 148-149. ↑ Chevalier and Gheerbrandt, 1025-1033. ↑ Chevalier and Gheerbrandt, 529-531. ↑ Chevalier and Gheerbrandt, 142-145. ↑ Chevalier and Gheerbrandt, 1020-1022. ↑ NASA, Nasa Apollo Mission: Apollo 13. 2007-08-25. Retrieved October 5, 2007. This page was last modified on 1 March 2016, at 16:00.